They just keep finding new places to add decoration! The back of your hand?! Yes, please. When I see people wearing these bracelet/ring hybrids (I'm calling it a hand chain) I get all excited, but I don't see them much in stores. Somehow it only now occurred to me to DIY some for myself, a fairly obvious solution. I made it two ways: one is more involved and bulkier, and the other is super simple and understated. Pick your poison and grab your arts and crafts bin, we're doing this! First thangs first: we need to made the necklace pendant into a ring. This is done by simply gluing the blank ring base to the back of the pendant with the E6000 glue. Maybe don't pose yours for a picture and it won't drip everywhere. Press the glue-topped ring base to the pendant and let it dry. While you wait, measure around your wrist with the chain. Make sure to leave a little wiggle room - wrists love to wiggle. Use the chain cutters to trim the chain to your desired length. 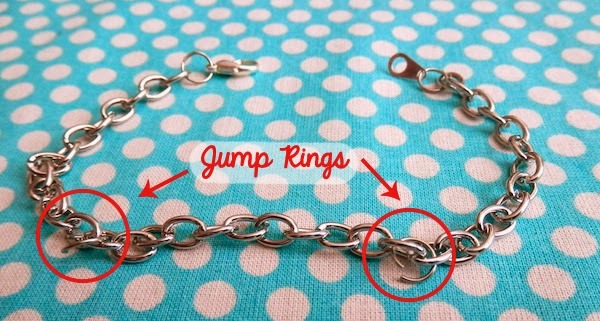 Use the pliers to attach a jump ring to each end and add a clasp to the jump rings. Now that we have the bracelet section ready, we want to add 2 more jump rings to the bracelet. These will connect the bracelet to the portion of chain that'll drape over your hand. They should be evenly spaced on top of your wrist (when you have the bracelet on) so try it on to make sure the jump rings sit where you want them. Use the pliers to add the 2 jump rings where you'd like them, but don't close them just yet. Next, just attach the free end of the chain to that still-open jump ring and close it up. 'A' for effort. I'll take it - thanks, self! You're done now. That's it. Show's over...go home. Oh, you want to see it on an actual hand, do you? Oh yeah! You want to make sure the chain you use will fit in the loop in your pendant. 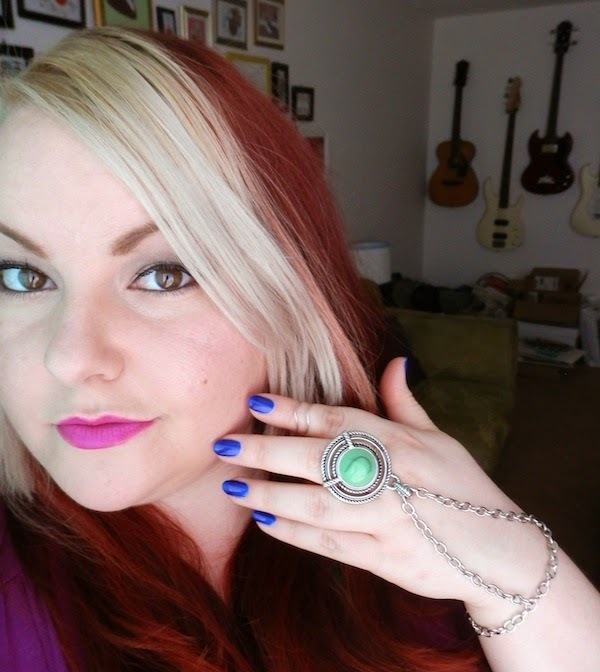 When you wear it, I suggest putting on the ring first and then struggling to clasp the bracelet for five entire minutes before angrily conceding that you will never be able to wear non-bangle bracelets and then letting/forcing your boyfriend to clasp it for you. Very effective. Okay, so maybe you like this free spirit-esque look, but also want the free spirit-esque lifestyle that just doesn't allow for time-sucking activities like waiting for glue to dry and opening a clasp. Wow, you're really in a rush there, aren't you? Luckily for you, I have a WAY easy solution for you if you can slow down for maybe 120 seconds. Do we have a deal? Use the pliers to add a jump ring to the open ends of the chain. This makes a closed loop of chain. Slide your long bead (so many kinds will work) over the entire chain loop, from the non-jump ring end. Obviously, the bead needs an opening that's wide enough to fit the doubled over chain. Position the bead close to the top side (away from jump ring). This gives you a vaguely bow tie-shaped situation. Like a bow tie in a fun house mirror. Probably worn by the clown in your nightmares. That is literally it. I think we have a few of those 120 seconds to spare if you care for a lemonade or something? Okay, maybe another time. Yeah, I'm busy with...friends and stuff. To put this guy on, insert your hand into the larger section of the "bow tie" so you're wearing the chain around your wrist with the jump ring underneath [A]. Then, slide the bead up and move the bracelet portion up so that the small side of the "bow tie" can reach over the top of your middle finger to wear it like a ring [B]. Side the ring part down, slide the bead down and adjust so the bracelet part sits around your wrist [C]. Picture [D] is the underneath view. 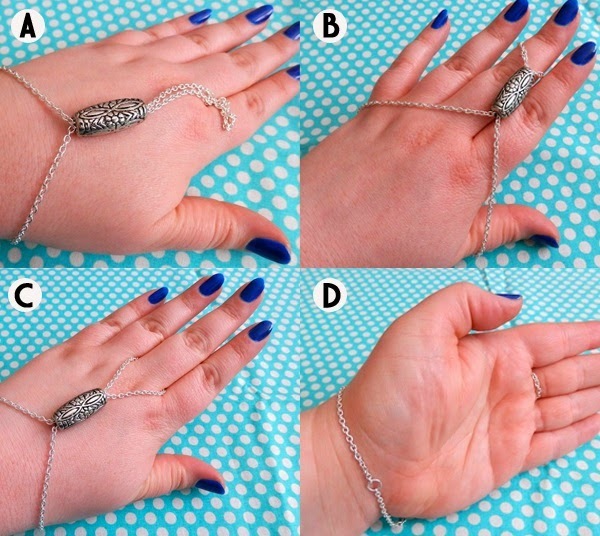 A simpler, more understated hand chain. 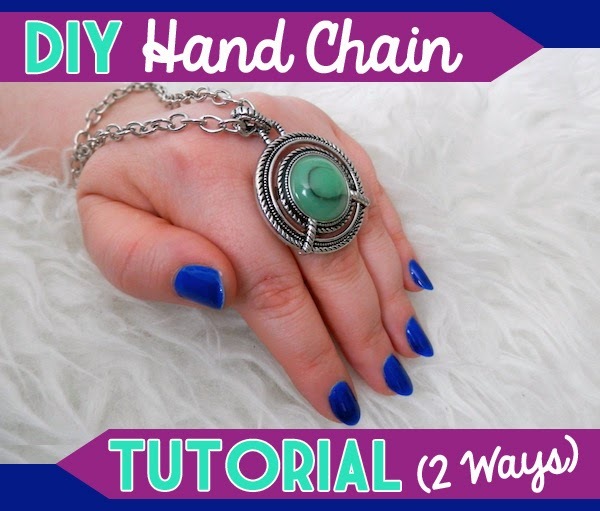 Are you into hand chains? Do you know what these things are really called? Do you jump at the chance to add decorative jewelry in MORE places, such as myself? LOVED THIS. Seriously, what a great tutorial. I think I favored the second one, but the first is equally brilliant! I used to be so into jewelry making so I'm thinking this should be a fun thing to try out when I have the free time! Wow! You look ready to hit some music festivals! I love the white furry background and your pretty nails. I 'll probably make some of these for concerts. YEY! Just found me another DIY blog♥ can't wait to try to make this! Ooh! I'm totally going to give this a go :)! Amazing diy idea. Looks super lovely. Very cool piece. This reminds me, I need to get making jewelry again, I miss it! Will have to try this DIY. What a great DIY. It looks fabulous! Any way for me to where another piece of jewelry! I am in! Love this idea! The one you made with the bold ring is fantastic! I am a huge fan of large pieces of jewelry!